Evan played with Play-Doh today. AND he played with a fire truck and a delivery truck at the Toy Store set up in the Home Living Center. AND he watered the plants as the classroom helper. AND, at group time, he told the whole class that his little baby brother was so sick that he had to go to the doctor. And at the doctor, he had to wear a mask to help him breathe. And now he has to wear the mask at home to help him breathe, but not all the time. Maybe all this time he thought he was allergic to school, too. The banner headline from today would read: Evan Passes Milk Challenge. The bi-line, however, would read: Max Has Bronchiolitis. I want to be celebrating that unbelievably wonderful and unexpected headline tonight with a family trip to Sweet Frog. Instead, I'm counting down the minutes until I can give my baby his next nebulizer treatment to help him breathe. You know, Universe, I wouldn't mind a little *less* karmic balance sometimes. So, Part 2 of Evan vs. The Cow was first thing this morning. We arrived at Dr. B's office well-equipped with Milk, Chocolate Syrup, plenty of distractions, and a complete change of clothes. We needed all of it. Evan first drank 1.5 ounces of chocolate milk and, after only a moderate display of obstinance, drank the additional 3 ounces. Almost immediately after finishing the last of the milk, Evan got really quiet and cuddled up on my lap in a little ball. His tummy was obviously hurting him. The nurse and Dr. B came in every few minutes to check him out and talk to him, and Evan tried really hard to put on a happy, brave face for them. At minute 54 of our one hour wait/period of observation, Evan puked. I was ready....the trash can was right beside us, but I wasn't quite fast enough. The extra clothes came in handy. At this point, my heart just sank. We were thisclose to getting a pass, I thought. But....Dr. B came in with a huge smile on his face and a hearty, "CONGRATULATIONS!" for Evan. Yes, Evan threw up after ingesting milk, but No, he does not consider him to be allergic to milk. This, according to Dr. B, is an Intolerance. Sure, "stomach pains" and "vomitting" are often listed as symptoms of an allergic reaction, but that doesn't mean that Evan has to avoid all dairy as we had been doing. "So what does this mean as far as restricting his diet?" I asked. "It means that YOU don't restrict his diet at all. Evan will restrict his own diet. He'll self-limit his intake of dairy because at a certain point it will start to upset his stomach." So, if he wants a slice of pizza, I can give him a slice of pizza. If he starts to refuse it after eating half, that's my cue that he's had enough. Sure, occasionally he might overdo it and get a tummyache or even get sick. Who hasn't occasionally over-indulged? The important thing: There was no allergic reaction. No wheezing, no swelling, not a single hive. These are the things that Dr. B was looking for. These are the symptoms we saw during Evan's severe reaction to milk as a baby. And these were the things that, in their absence, gave us the Pass. A good day, indeed. To our raspy, rattly, wheezy baby. Our baby, whose ear infection was clearing and who, aside from a mild, pesky cough this weekend, enjoyed a wonderful Thanksgiving Holiday. Our baby, who all of a sudden sounded so Sick, that his mommy called the pediatrician and took the next available appointment. She also wrote a prescription for Albuterol so we can have this fun again every four hours until Thursday and then every six hours until next Monday. I haven't been this happy since the two times I found out I was pregnant. Truly. To outgrow three major allergies by three and a half is something to be celebrated. And I haven't had a baby this sick since Evan's reaction to milk. It's like my life as an allergy mom came full circle in one hectic morning. Big Day around here: This morning was Evan's MILK CHALLENGE! And Max has his first ear infection. Just like in the egg challenge, Evan was to ingest tiny amounts of milk in increasing dosages until he had ingested the equivalent of a full serving. Starting at 1/4 tsp., we were working our way up to 3 ounces, which would have equalled about 6 ounces over the course of the 4+ hour test. I say "would have" because we didn't quite finish the test. Not one to routinely Not Finish Things, I'm left feeling a little....well, unfinished. Ill at ease. Unsettled. I need to look at the positives! EVAN DRANK MILK TODAY!!! And we didn't go to the emergency room! He drank the equivalent of about an ounce and a half before he vomited. Yup. All over the testing room. But this was after the most stubborn display of lip-clenched, angry-eyed, You-Can't-Make-Me tantruming those nurses have seen in awhile....probably since Evan's egg challenge. And, it was after the I've-Tried-Everything-Else decision on my part to suggest that after each teeny sip of milk, he chase that taste away with a gulp of juice. So Dr. B wasn't convinced that it was an allergic reaction, perhaps just a behavioral reaction. You know, tantruming plus a liquid-filled belly of milk and juice doesn't always sit well. So we went on with the challenge. We waited an hour to make sure there were no other signs of a reaction. During this time, I called in the Daddy Reinforcements. Daddy brought with him the Chocolate Syrup Reinforcements (and Max, the Cheering Section). The chocolate syrup worked wonders and Evan downed the 1.5 ounce dose in three big swallows. Success! We were one dose and one hour from The Official Milk Challenge Pass! And then he threw up again. So we ended the test. Dr. B still isn't convinced that it was allergic, but we were ALL ready (after more than four hours) to call it quits. Evan can be around milk! We're not worried about contact reactions anymore, and we're not worried about cross-contamination. We're not EVEN worried about accidental exposures because the likelihood that he would accidentally ingest more than he drank today is slim. For now, no major dietary changes. Dr. B said we can go ahead with baked goods that are made with milk, though, so that's a pretty huge step. (Although I still prefer my vegan cookies and cupcakes to anything "traditional.") It means that we can be a little more relaxed about ordering food for Evan from a restaurant. We can send him to birthday parties with a little more confidence that the icing on the birthday boy's cupcake won't make him an itchy mess. We can let him play at the Barnes & Noble train table and not have to wipe down his whole body to ward off contact hives from the Goldfish dust the other preschoolers left behind. We don't have to hound our family members and friends to hose down after eating before touching our kid. We don't have to worry that a stray piece of shredded cheese in the guacamole might send our kid into anaphylaxis. And next Monday, we're going to finish off this beast. We'll return to Dr. B's office for Milk Challenge: take 2. We'll try 1.5 ounces of (chocolate) milk first and then the full 3 ounces. If we make it past that, it's considered a True Pass; an outgrown allergy. If not, then we'll at least know his threshold. From there? We'll see....but tonight: we celebrate some really fantastic news. I'd just like to take one snarky minute to say, "So There!" to the first allergist who treated Evan. At that very first, life-changing appointment, we were told that, due to the severity of Evan's reaction to the skin prick test, "Evan will never outgrow his milk allergy." What depressing news to tell these two new parents of a healthy 11-month old baby! We had just been told that our baby would never live a normal dietary life. We were told that he would always be at risk for having a severe and life-threatening reaction to a food so common that we would have to be constantly vigilant. What we needed that day was a little positivity, a little hope. Instead we left that appointment scared for our little boy and feeling completely lost. Thank you, Dr. B, for giving us that hope. This may not be an outgrown allergy today, and it might not be an outgrown allergy next week, but we are optimistic for the first time that our little boy may not be The Allergic Kid his whole life. And THAT, in itself, is reason to celebrate tonight. Some kids are born doodlers. I was one of them. To me, there was nothing better than a freshly opened 64-pack of Crayolas. I think that may be why I became a teacher, actually--I was in it for the school supplies. I was a doodler, a colorer, a drawer, and eventually, a writer. Evan is not one of those kids. I have an entire cabinet full of art supplies that has been largely left untouched. Until Max came along. I spent about $35 total (on the mini-drawers, the cork boards, and the Post-It Wall Pockets--are they not the coolest things you've ever seen? They stick on to the wall with sturdy double-sided mounting strips, but are apparently easy to remove and won't damage the wall--I had all of the other supplies left over from my teaching days.) and the center came together in just a couple of hours. I have seen beautiful Writing Centers with pegboards and acrylic file folders and miniature buckets filled with perfectly new crayons. They're gorgeous but pricey, and I was operating on a budget and a timeline. This works for us. He dove right in! In fact, while I was assembling the Center, he grabbed a pencil and a spiral notebook and took Daddy and Max on an Animal Exploring Mission. He looked for animal tracks in our playroom and recorded what he found in his Animal Exploring Notepad. See?! AUTHENTIC WRITING! But who could resist that drawer full of 64-brand new Crayolas? If Evan ends up not being an art or words kid, that's alright with me. It's worth it, though, to give him spaces in the house where he can try on all sorts of hats to find what fits. Which reminds me....we are in DESPERATE need of a dress-up box for the I-Don't-Wanna-Wear-a-Costume Kid. I smell a new project! I've said it before but I'll say it again: Time to babyproof! Today's my birthday...my 31st birthday. You wanna know how I celebrated? I bought myself a new vacuum. BUT....not just ANY vacuum...a DYSON. And the icing on my birthday cake? 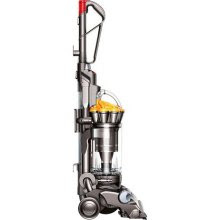 I was able to combine my Kohl's cash AND my 30% off coupon to get this $449 Dyson for $260. So I guess my excitement over the vacuum AND the deal I scored solidify my standing as a Certified Mom, huh? Because of last night's puking, we cancelled our Fun Friday plans and opted instead for a Jammies Day. We had a nice, snuggly morning, but by 10:15 am, we had read all of our library books, played with Every Single Little People playset we own, and emptied the supplies from the Art Cabinet about a dozen times. So, we were ready for an activity. Luckily, I have been browsing a website lately that was just full of ideas. So, thank you Playful Learning, for the inspiration. And there you have it. Our Tree of Thanks. I think we'll keep adding to it over the next few weeks. Maybe we'll bring it to Thanksgiving Dinner at the grandparents' house and have the extended family add their own Leaves of Thanks. "Hmmmmm....I'm thankful for.......hmmmmmmm.....le's see........Oh! Mommy! AND fire trucks." I was puked on tonight--like, full-force, Exorcist-style puke--for the first time since Peter threw up all over my Girl Scouts uniform in first grade. After, I had to sit in the clinic with Peter, with his head in a trash can, while we waited for our moms; his to take him home, mine to bring a clean set of clothes. That afternoon, I was the only girl in my Girl Scouts troop that wasn't wearing her uniform. I was a little traumatized. As I was cleaning up the puke tonight, I remembered Peter and then I started thinking about other moments from first grade that seem as vivid to me as moments from last week. Has it really been twenty-five years? First grade was a pretty good year for me. It was before my school anxiety hit me head-on in second grade, AND my best friend, Daniel, was in my class. This one time, in first grade, we were working on a project about the classic children's book Where the Wild Things Are. Daniel was writing with a pencil that he had sharpened so much that it was essentially an eraser with a graphite point. (He was *that* kid, that spent 15 minutes at the pencil sharpener every half hour.) His little first-grade hand was all scrunched up as he tried to grasp it, but he refused to use the perfectly-sharpened spare pencil that I had in my pencil box and had offered to him. (I was *that* kid that was annoyingly Always Prepared.) As our teacher walked over to our desks, she looked down at Daniel's pencil and said, "Daniel, I'll never be able to read your chicken-scratch writing if you continue to use that nub of a pencil." This, to Daniel and me, was hilarious. I'm not sure if it was the image of a chicken scratching on his paper or the word "nub," but Daniel and I could not stop laughing. For weeks afterward, Daniel would do his best Miss H impression and repeat that line and we would just fall into hysterics. Another time, it snowed. It was the first snow of the season and we were all, understandably, Very Excited. In an effort to appease the masses, Miss H allowed three students at a time to go and stand at the window to watch the snow fall for a minute or two. There was one girl, though, whose name I can't remember, who had just moved to our neighborhood from Florida. Because this was the very first time she had seen snow in her WHOLE LIFE, she got to stand at the window THE WHOLE TIME. This decision by Miss H was seen as grossly unjust by the rest of the first-graders. Then there was the time that my cat, Mittens, followed me to school. Our house was about a mile from the school, but not quite far enough to be on the bus loop. The neighborhood moms organized a carpool, but on nice days we would walk or ride our bikes to school. One day, my cat followed behind our gang at a comfortable distance--we had no idea we were being tailed. Mid-morning, I was called to the office over the loud speaker. When I got to the office (shaking, I'm sure, because I had been CALLED TO THE OFFICE), there was my cat, sitting with the secretary. Apparently, Mittens had jumped into an open window of a classroom across the pod from mine. I'm not making this up. My neighbor was a student in that classroom and recognized my cat, probably because of her distinctive white paws (get it? Mittens?). It was the talk of the lunchroom, let me tell you. It's probably not likely that it will be another 25-years before I'm puked on again. Bummer. to keep up with the Joneses' kid? A few years ago, I was taking a walk with Evan, then just a baby, around my neighborhood. As I turned the stroller around the corner and down another street, I saw a bunch of the neighborhood kids gathered together. One child, maybe 8 years old, was on his knees in the grass, with his hands behind his head. Another child, not older than 10, had a rifle slung over his shoulder and was grasping him by his raised arm. A third boy stood in the road facing the boy on his knees, separated by a distance of less than 10 feet. His rifle was raised, pointed directly at his playmate's face. The guns were fake, but my horror at the scene was real. I went home, shocked and saddened by what I had seen. Where had these kids learned to "play" like that? And what kind of parents allowed that type of play and those types of toys in their houses? That night, I fired off an email to the parents of the kids involved. I described the scene I had witnessed and wrote that, if MY child had been "playing" like that, I'd want to know about it. I also wrote that what I had seen offended me and that, as the parent of a very young child, I didn't feel comfortable with that type of behavior going on in plain view around my neighborhood. I asked the parents, because the guns used actual BBs, which could actually be physically harmful to a casual passer-by, to please restrict their children's play to backyards only. I'm sure my email was met with a bunch of irritated eye-rolls and mutterings of the "overly sensitive, naive, first-time mother." I don't know what the real responses are, actually, because I never received any. But the gun-play continued, and it continued in the streets and front yards in certain sections of the neighborhood. And so, we stopped taking walks in those areas. The kids have grown up to be middle-schoolers and so the gun-play was neglected in favor of texting and sulking in their bedrooms (and sports, art, music, and volunteerism, to be hopeful). But the guns are still in my neighborhood, passed down to younger siblings and picked up by the next wave of elementary school-aged kids who live here. The parents of the kids who play with the guns now are my friends, and we've talked about the gun-play. None of the parents are happy about it and most have rules related to the type of play allowed and when and where the guns are to be used. But if none of the parents love the idea of their kids playing with guns, then why the hell are there so many kids playing with the damned things? It's because everyone else is doing it. Every parent says the same thing: All my kid wants for Christmas/his birthday is an AirSoft Rifle, and if I don't buy my kid one, then he'll have no one to play with because Every Other Kid is playing with his own AirSoft Rifle. Well, I can tell you this with absolute certainty: my kids will Never Own an AirSoft Rifle or any other BB gun. Evan's never even had a squirt gun. I just plain don't see the point. In my house growing up, we didn't have guns. The kids in my neighborhood filled our summer days with baseball, Barbies, and bike riding. We did have the occasional Super Soaker and Nerf Ball Blaster, but they didn't look like real guns. And we certainly didn't stage mock executions in our front yard. Yes, times have changed, I get it....but it's BECAUSE times have changed that I feel even more strongly about my position: my kids won't play with guns because REAL KIDS are USING REAL GUNS to inflict REAL terror and harm. Why would you let your kid make that into a game? So where's the line? This is where, as parents, we're going to have to figure it out as we go. Is "Cops and Robbers" okay if the cop is holding a gun-shaped stick? How about soldiers? Can my kid play at defending his country? And what do I say when my 10-year old begs for the ONE thing that EVERY other kid in the neighborhood is playing with? Do I set him up for social isolation? Do I prevent him from going to other kids' homes for fear of him being involved in gun-play where I can't monitor what he is playing? Seriously. That's not a rhetorical question. I know my oldest is only three, but I want to be prepared for when he DOES ask for a toy (a gun, a video game system, whatever) that we don't necessarily approve of, but that every other kid has......do you give in and get it for him? Or do you, ahem, stick to your guns and risk his social standing in the neighborhood? It's really easy to say, with absolute certainty, how you'd act in a certain situation before you're in it. Just like I swore I'd never use TV as a kid-sitter while I surfed the web on the couch during Quiet Time, or use marshmallows and chocolate chips for bribes to get my kid to use nice words or pee in the potty. When exhaustion, desperation, or lack of a better option has set in, I've been known to change my position. So can I say, with absolute certainty, that my kids will never play with guns? Maybe not. But I'm sure going to do my best to prevent it because I CAN say, with sincere and complete certainty, that the thought of seeing Evan or Max, on their knees in my front yard with a rifle pointed at their face, makes me want to throw up. Ladies and gentlemen, we're back on track. My sweet little snuggly Evan is back. Evan is no longer taking any medication. We figured that we can deal with the sleep challenges, we can NOT deal with the quick-to-temper, tantrum-prone, anxious kid that the medicine was helping to create. Evan's sleep is improving, for now....I think it's just going to be a cyclical thing....a period of good sleep followed by a period of frequent night-wakings, probably triggered by transitions, illness, growth spurts, etc. Evan is responding to the incentive programs we've been using: sticker charts, chocolate chips, special time, etc. But he's not dependent on them. If we forget to use the sticker chart one day, it's not a tragedy. It doesn't affect his behavior negatively, only reinforces the positive behavior. The random Marshmallow For Being So Sweet helps, too. I think the best thing is to randomly "catch him being good" (to borrow from my teacher training courses). And finally: Evan is more than 2 weeks older than Three And A Half. My pediatrician tried to tell me that the six months between 3 and 3.5 were the toughest for the vast majority of kids. I didn't believe her while we were in that window. I felt like my kid had forever changed and I wasn't going to get him back. I swear, it was like the lightswitch flipped that week he turned 3 and a half and we ARE back. The past two weeks have been lightyears better than the six months that preceded them. Not that I think we're out of the woods for good. I'm sure every stage of development will bring with it it's own set of challenges....but I think we can take a few deep breaths and just enjoy our boy...for now. **Evan came into Max's room right before bedtime. After talking to Max and me for a few minutes he stopped himself mid-sentence and said, "Wait, Mommy! I can't chat now! I'm missing out on reading time with Daddy!" **At various times over the last few days, he'll stop what he's in the middle of and say, "Which reminds me! I need to _______." And then he'll go do whatever it is he was so suddenly reminded of. **He's started calling Max his "darlin." Not like he's unintentionally dropping the G...but like he's intentionally fakin' a drawl. **As we were walking back to the car after Parent-Teacher Conferences, I said, "Isn't it funny that Mommy and Daddy went to preschool today instead of you?" and he said, "Which reminds me! What can you tell me about your day?" just like I ask him when I pick him up from school. I'll just consider Getting Through these last six months to be another notch on our Parenting Belt. This notch was bigger and louder and uglier than previous notches, and we'll certainly be able to use what we've learned about ourselves and about parenting, but we're movin' on. Darlin'. Once the people (or, person) had spoken, the Jack-O-Lantern was carved. I did the carving, Max did the supervising. Daddy and the boys worked on a less dangerous Pumpkin Decorating Project. Although, Evan still managed to get his hands on a pumpkin carving knife, which Max is careful to keep a close eye on. Evan isn't a "costume" kid. He's not a "talk to strangers, or even people he kinda knows" kid. He's not a "upset our normal routine by going out after dark and staying up past his bedtime" kid. So Halloween isn't his fave night. BUT: Man did he do a great job! Evan wore his "costume," he rang doorbells, he spoke to our neighbors, he stayed up late, he scored some candy (thanks to my great neighbors for providing Evan-safe candy! ), and he Truly Enjoyed Halloween. I'm so proud of him. The choice to go trick-or-treating was his....we weren't going to push the issue...and I know that he was stepping outside of his comfort zone to do it. We encouraged him and stood right beside him, but he didn't need much support once the Trick-or-Treating had begun. He ran up ahead to the next house yelling back to Daddy, "Just try to catch up to me, Daddy, you can't catch me, I'm TOOLMAN EVAN!" And Max, in classic Second Child fashion, was thrilled to just go along for the ride. And he even kept that ridiculous pumpkin hat on All Night Long. The only thing better than seeing your kid muster up the confidence to do something that takes courage, is seeing the look on his face when he realizes that the payoff for all that mustering is CANDY.